Canton Lounge Bar is a hidden little world in Perth City. It is quite a hard place to find; you would never think of going on that side of Perth to find such a bar. Located off Hay Street, far from all the hustle of the city, you have to go through a red corridor and up a few stairs before entering this wonderful place. 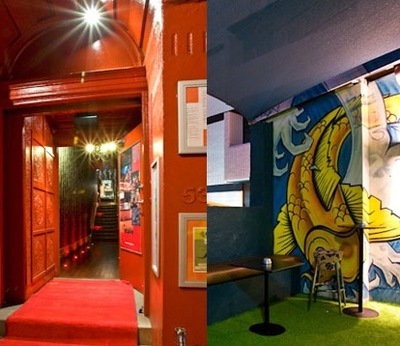 This lounge bar is a unique venue in Perth. It has a main room, which has a massive chandelier in the middle, front lounges and a small outdoor terrace. This place is very sophisticated but the outdoor smoking area is quite a contrast to this sophistication. It hides a concrete wall covered with amazing graffiti art. Inside, there is the bar, small lounges with nice comfy couches and coffee tables, and there is of course a dance floor. The bar, furnitures, walls and décor have this kind of modern grunge style. The staff behind the bar provides a great service. They are really quick and efficient and they seem to know what they are doing; mixing cocktails, serving beers and pouring someone's wine at the same time. On the cocktail menu there is a big selection of international beers and a wine list that is changed according to every season. 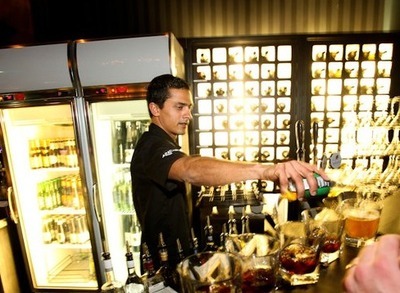 The cocktails are created by the bar staff, which makes the cocktail menu pretty unique. I actually tasted my first Mango Beer at Canton Lounge. I had heard about it but never really noticed them anywhere else. Very good and refreshing beer - great for summer. Canton has a great menu with a selection of bar snacks and tapas. There is an express lunch menu from $12, which offers delicious gourmet lunch, only between 12am-3pm and bookings are required. The menu also changes every now and then and they always have creative and tasty things to eat. Last time I went, they had this delicious chorizo tapas and marinated olives. Simple but good. If you are planning to have diner there, it's always better to make a booking, especially if you are a group. I think the Canton is spacious even though the venue is quite small. You don't feel like you're in a small area at all. It's a pretty relaxed place even though the décor shows more sophistication. There is usually live music and DJs playing on Friday and Saturday nights. There is free wireless Internet available for the customers, which makes it great for a coffee meeting or for those who need to work during their lunch break. Canton Lounge is also available for special occasions such as birthday parties, cocktail parties, corporate functions or wedding receptions. Why? 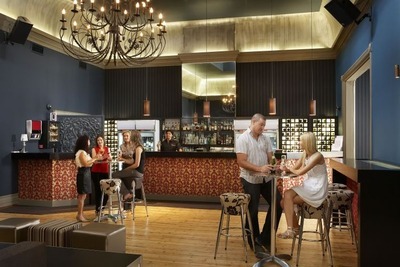 Canton Lounge Bar is a hidden little world in Perth City.